Are you a local educator? 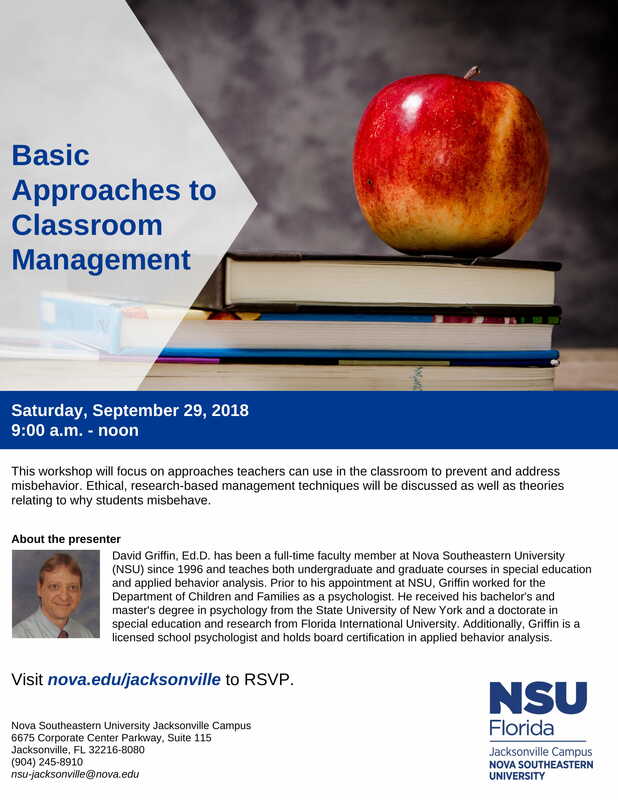 Join the Nova Southeastern University (NSU) Jacksonville Campus on Saturday, September 29, 2018 from 9:00 a.m. – noon for the workshop Basic Approaches to Classroom Management presented by David Griffin, Ed.D., associate professor at the NSU Abraham S. Fischler College of Education. This workshop will focus on approaches teachers can use in the classroom to prevent and address misbehavior. Ethical, research-based management techniques will be discussed as well as theories relating to why students misbehave. This event will be held at the NSU Jacksonville Campus located at 6675 Corporate Center Parkway, Suite 115, Jacksonville, FL 32216. It is free and open to the general public. 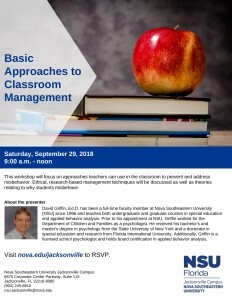 Please RSVP at nova.edu/jacksonville. For more information, contact the NSU Jacksonville Campus at nsu-jacksonville@nova.edu or (904) 245-8910.